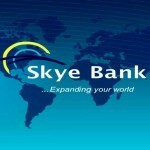 (AFRICAN EXAMINER) – The recent revocation of Skye Bank’s Operational license by Central Bank of Nigeria (CBN) and subsequent acquisition by Polaris Bank Limited have been strongly criticized over lack of transparency and due diligence. 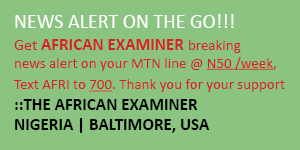 Mr Luqman Soliu, President, Rights and Freedom Advocates (RIFA) in a statement made available to African Examiner alleged scam in the Skye Bank acquisition deal even as he argued that Polaris Bank Limited may not have been registered as at the time it acquired now defunct Skye Bank. “In a release made available and dated September 21, 2018 titled POLARIS BANK LTD and directed to depositors and customers of Defunct Skye Bank Plc which was signed by Adetokunbo M. Abiru; the acclaimed Group Managing Director/ CEO of Polaris Bank Limited and the purported Chairman; Muhammad K. Ahmad claiming to have acquired assets and liabilities of Skye Bank Plc as from that date. “The release claimed that Nigerian Deposit Insurance Corporation and Central Bank of Nigeria were fully involved in the take-over of Skye Bank Plc by a ghost company called Polaris Bank Limited. Rights and Freedom Advocates (RIFA) noted that the deal leading to such release was a pure tripartite scam by the Management of yet to be registered (as at September 21, 2018) Polaris Bank Limited, the Central Bank of Nigeria (CBN) and the Nigerian Deposit Insurance Corporation (NDIC). “A search for Polaris Bank Limited on the website of Corporate Affairs Commission (CAC) as at 11:47 pm on Sunday 23rd September, 2018 showed the company; Polaris Bank Limited was yet to be registered by Corporate Affairs Commission yet it was allowed to acquire a bank of Skye bank status on anticipatory ground. “However, surreptitiously and fraudulently, by Monday morning at 11:02 am of September 24, 2018, a strange Company; Polaris Bank Limited with registration number 1525101 and office address as Leadway House, 4th Floor, Plot 1061 Herbert Macaulay Way, Central Business District (which City or State? 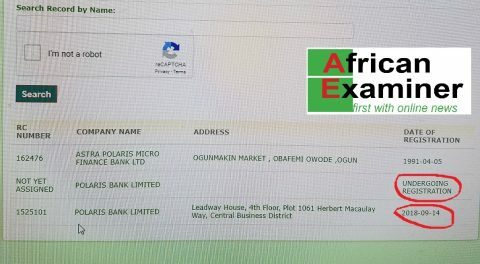 Presumably Lagos) was said to have been registered on 14th September, 2018 leaving another Polaris Bank Limited on the page as registration in progress while another Microfinance bank with similar name having headquarter at Ogunmakin was still there as it was on the evening of Sunday 23 September, 2018. 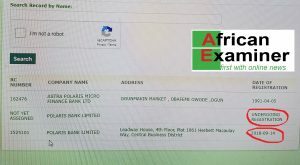 If by Sunday 23 September, 2018 there was no registered Company in Nigeria with the name Polaris Bank Limited, how then did Polaris Bank Limited that came alive on Monday 24th September 2018 got registered on September 14, 2018 and yet non-existent on CAC website as at date of acquisition of Skye Bank Plc? Those who thought they are smart in fraudulent deal must by now be cautious, at least, if they have any lesson to learn from the experience of Mrs Kemi Adeosun who was given fake National Youth Service Corps exemption certificate. “RIFA wonders if there was any bidding /expression of interest, screening and assessment by NDIC and CBN before consideration and granting of license either in principle or final to a ghost Company to take over Skye Bank Plc. The laws of the land recognize that only registered Companies must be allowed to operate and bid for anything in the land. But in the case of Skye Bank Plc, the bank was sold to a non-existent Bank. “This revelation shows some shady deals among the various regulators of Nigerian financial sector. What papers were presented to CBN and NDIC for review before the Company was allowed to take over Skye Bank? Who are the promoters/shareholders and directors of Polaris Bank Limited? Are they not the officials of NDIC or CBN or their cronies? Who among the staff of Central Bank of Nigeria and Nigerian Deposit Insurance Corporation assessed and approved the acquisition? Is this not the way our Kemi Adeosun NYSC certificate was dubiously issued? “Therefore, RIFA demands that the Federal government should avert looming crisis in financial sector by probing the acquisition of Skye Bank Plc and registration of Polaris Bank Limited. The President of the Federation should immediately disengage the Governor of Central Bank of Nigeria and his counterpart at NDIC for this flagrant robbery. “Which officials of the Corporate Affairs Commission (CAC) were involved in the backdating of the date of incorporation of Polaris Bank Limited to September 14, 2018 when the acquisition was done on September 21, 2018 as a cover to calm public outcry? 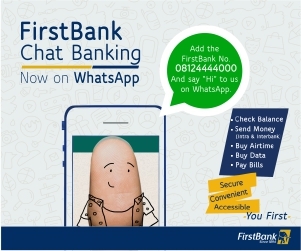 “RIFA calls on relevant agencies especially the Economic and Financial Crimes Commission (EFCC) to wade in and unravel the misery surrounding Skyebank acquisition gate. The Shareholders must not sleep as they must take the case to court.